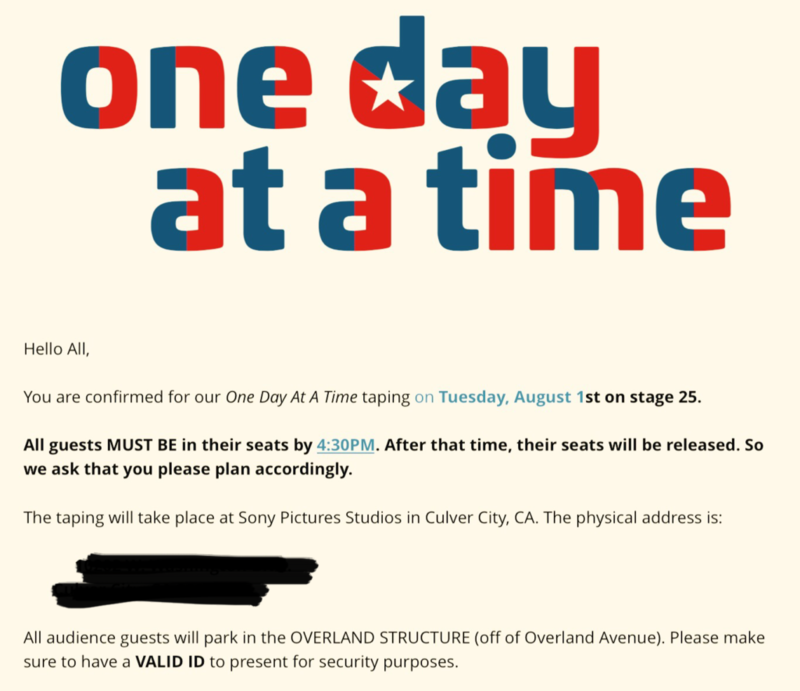 The original plan was to go to the taping on July 5th before my trip to DC and Boston. That didn’t happen. What happened instead was something of a Hollyweird miracle. Like most people, we used Audiences Unlimited to get the tickets. We used them last time and it was great. They’re free, but also first-come/first-serve. You book your tickets online, print them up, and come to the lot. You get a number in line and off you go. Except this time, the line was incredibly long. Last time, we were numbered in the 60s. This time we were 100 and 101. I didn’t think much of it until they told everyone from 115 and up that there was no seating for them. Then they told 105 and up… and then they told the rest of us. This was no one’s fault. It wasn’t because we were a little late (oh LA traffic, why you gotta be like that? ), or that the company misjudged anything. 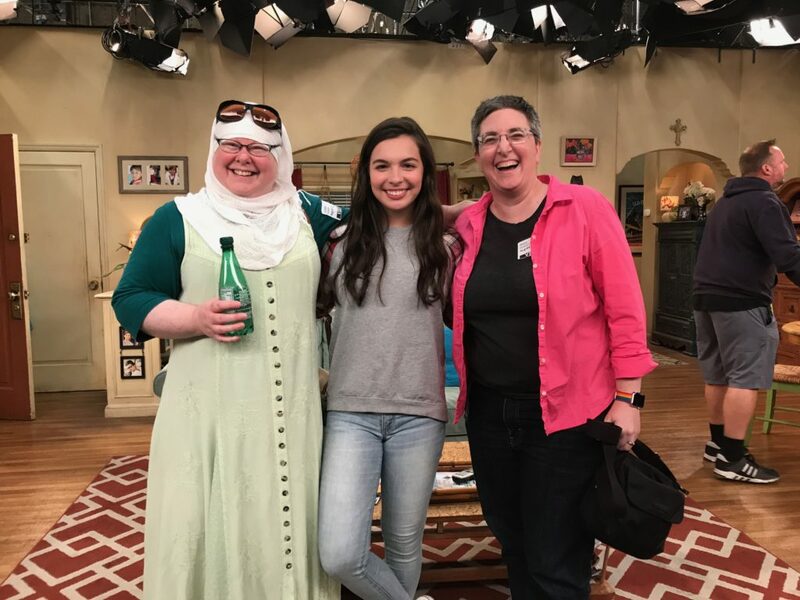 One Day at a Time was the only show left filming that week, so everyone who’d gotten bumped from other shows the week before came over. The priority people are seated first, of course. That meant, however, that there were less than 70 seats available, and we were behind the cutoff. While that sucked, Audiences Unlimited was incredibly kind and caring. They talked to us all, politely and respectfully, explaining that they just didn’t have the seats. I immediately thanked them and said not to worry, it happens. After all, I’d read the tickets which said that it may occur! Then they gave us ‘passes’ which let us pick another show (anything except The Big Bang Theory or Fuller House) to attend. On the way to our impromptu date night, I called the number on the card and inquired about the finale, because I’m no fool. Then we went out for that date … and a few amazing things happened over the course of the next 24 hours. First, a friend we’d made from the set (who said she’d meet us there) helped us get tickets for another night. It was incredibly kind of her, and my wife and I discussed possible appropriate thank you gifts. Then Audiences Unlimited contacted us and got us passes for another night (yes, a second one). I thanked them effusively and asked they please tell their management that the staff from July 5th were wonderful. Well. Be still my heart! Because one more thing happened. The show squeezed us onto the guest list. 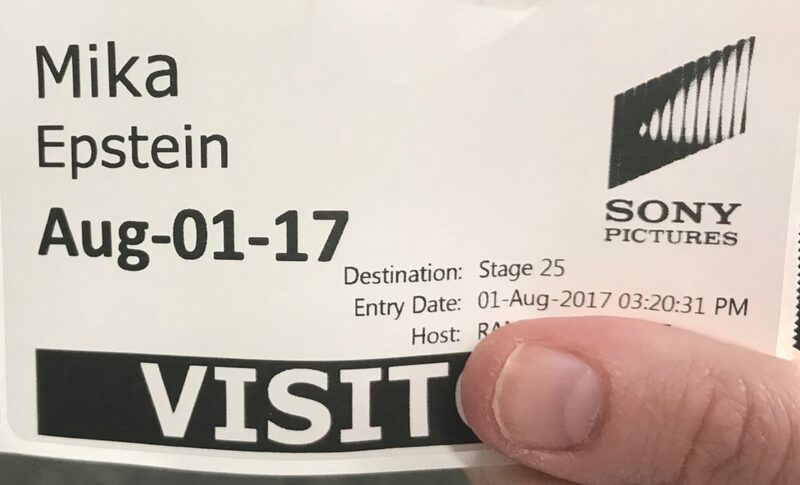 Mike Royce, who is quickly becoming one of my favorite TV people, put me in touch with the people who arrange for ‘special’ guests. The ones who don’t have to go through Audiences Unlimited and wait and hope for a seat. They asked what dates we were interested in, and then there we were. On a list. The funny thing is we basically had a month of knowing all this and not being able to tell people. Of course I told Tracy everything, and my cousin (who took my vague tweets as reason to worry about me, thank you CD, I love you too), but besides that, my wife and I kept super mum on the whole thing. I’m not a fan of lying to people about situations, but at the same time, I know that sometimes plans fall apart. Sometimes people change their minds. It just happens. And as the day crept nearer and nearer and the ‘we’ll be in touch’ didn’t loop back around, I did get worried. I’m like that. I worry. Especially since they announced Mackenzie Phillips (from the original) would be guesting again. But I clutched my ’emergency normal tickets’ in hand and was patient. I jumped out of my seat and fangirled. Guard: Are you a VIP? Wife: Seriously? How does she know!? Guard: She has that look. Yes, I need to not gnaw my thumb. They sent us to park, and then the security let us in. Yeah. With our phones an everything. We just … walked in. We were super early so we wandered, slowly, to Stage 25, bumping into the young gentleman who’d been our contact. He said we could walk around or go to the commissary or the coffee shop and enjoy, but be back by 4:30-4:45. We went and sat in the AC for a bit, me taking notes for this post, and then began our meander over again. This time we ran into a lovely woman we’d met at the Paley Center, who had been instrumental in getting us the passes for the show. Of course there was hugging, and she told us it was a great episode. Spoiler: They’re all great episodes, Brent. As with last time, I can’t tell you anything. You’ll get to binge the season in 2018 (probably January) and you’ll enjoy it with everyone then. Also, even though I had my phone, I couldn’t take pictures, not even of the empty sets. This is in part because someone recorded a part of the previous episode and leaked it on social media. I have some pretty strong feelings about people who leak spoilers about a show. In the case of most network shows, the taping airs a few weeks before the airing, so a spoiler isn’t horrible. In the case of a show on Netflix, though, when it’s six months or so between taping and airing, a leak can ruin the show. And that’s just not cool, friends. If you’re told “Don’t take photos or videos” then you don’t take photos or videos. Now. What I can tell you about the episode is that Rita Moreno blows my mind. She had a scene that was just not working. Anyone who acts will tell you that you just have a moment or a day when your brain is not cooperating. Rita had that in a scene and it took longer than usual to get through. When she did, she came up to the audience, took the MC’s mic, and explained sometimes it just doesn’t come. She may have dropped an F bomb (we all already knew Rita has a mouth like my grandmother). The audience clapped and told her we love her. Because we do. I can also tell you that Justina Machado is brilliant and this was the episode with Mackenzie Phillips in it, so make of that what you will. I said the night was magical, and it was. Because after the show, Mike Royce came up and chatted to us. We talked about the episode and which one we’d be back for. He said it was good, but they’re all good, and we joked that for us, it’s like which of our favorite ice creams do we love most, but for him it’s like which of his children did he love most. We got to meet his wife, who recognized the name LezWatchTV, and thus began a hilarious conversation about how I was Mika LezWatch, this was my wife Mrs. Mika LezWatch, and the other person who runs the site is Tracy LezWatch. Note: I asked before I posted this if we could share the photo. Isabella was fine with it, and so was the exec producers. No spoilers! But yes. We got to see the set a little and meet Isabella. Who is exactly as darling as you think she is and she doesn’t take a bad picture. At all. I’m on the right in the hot-pink shirt, my wife is on the left in the green and the scarf. We hung out a little, chatting about the show and the episode we’d seen taped before. We also explained what the toaster meant on the website. We also got to talk a little with the crew and I found a fellow Jack Benny fan. And then, under the moon, we walked back to our car, grinning a lot and having had, indeed, a wonderful night! First of all, TV Tickets (aka Audiences Unlimited) is the real deal. It’s not a scam. They’re also some of the nicest people out there. They have a weird, crazy job and they do it very well. I have nothing but respect for them. Second, being nice in the universe does pay off, but so does being brave. Who would have thought that speaking up at the Paley Center would bring us here? Speaking up, making sure that people knew that their work representing others was seen and appreciated, all of that matters. It’s like calling your senators, even though you know they’ll vote the way you want, just to thank them. You’re helping them and inspiring them to do more. Thank you to everyone on One Day At A Time. We know it was probably a little thing for you, but it really was a wonderful thing for us. We appreciate the stories you tell so much, and I can’t wait for everyone to see what a fantastic job you’re doing with season two.